Swedish golfer Annika Sorenstam is one of the best golfers to set foot on the green. She won the first two U.S. Opens that she competed in and has been inducted into the World Golf Hall of Fame. "I'm very proud about what I've done and pleased about my career," she told Golf World. By June of 2004 she had fifty-two victories to her credit, ranking her in sixth place among the best players in golf history. With such impressive achievements behind her, she began to consider the possibility of retiring in the next few years. 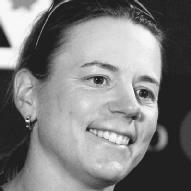 Annika Sorenstam was born on October 9, 1970, in Stockholm, Sweden. Her father, Tom, was an executive for IBM. Both her parents were athletically inclined, and participated in several sports including track and field, handball, basketball, and golf. As a youth Sorenstam most enjoyed playing tennis. She participated in her first tennis tournament at age five, but by age sixteen she began to feel burned out on the sport. She had begun playing golf at age twelve, and now turned her energies toward this sport. Golf, she found, suited her better than tennis. "In tennis, you always have to have a partner.... In golf, I could be on my own," she told SI.com. She qualified for the Swedish junior national team, and her career took off from there. In 1990 Sorenstam was offered an athletic scholarship to the University of Arizona at Tuscon. In her freshman year she won the National Collegiate Athletic Association (NCAA) golf championship and was also named College Player of the Year. She left school after her second year in order to play golf professionally. She went to Europe, qualifying for the European Women's Tour in 1993. She was named Rookie of the Year on that tour. The following year she qualified for the Ladies Professional Golf Association (LPGA) and earned the title of Rookie of the Year. In 1995 Sorenstam finished in the top ten for seven of the eleven tournaments and then won the U.S. Women's Open, which is the most prestigious event in women's golf. That same year she was awarded the Vare Trophy, given to the player with the lowest scoring average of the season, and was named LPGA Player of the Year. "I am a person that's all or nothing. If I can't be on top, because I have been there, then I don't know if I can handle that. I don't like finishing in the middle. I never have." Annika Sorenstam hits from the sand trap during the Bank of America Colonial. Classic. Sorenstam made the top ten in fourteen tournaments and finished in the top five seven times. No women's golfer had ever won at the U.S. Open three times in a row. In 1997 the pressure was on Sorenstam to do just that. Although she performed admirably that year, with six wins—the Chrystler-Plymouth Tournament of Champions, the Cup Noodles Hawaiian Ladies Open, the Longs Drug Challenge, the Michelob Light Classic, the CoreStates Betsy King Classic, and the ITT LPGA Tour Championship—she could not pull off another Women's Open win. Her top rival that year was Kerrie Webb, who took the 1997 Vare Trophy. But the competition inspired Sorenstam to work harder, and she was once more named the LPGA Rolex Player of the Year. In 1998 Sorenstam reclaimed the Vare Trophy, breaking Beth Daniels' record by finishing the year with an average score under seventy. She won five more championships: the Safeco Classic, the Michelob Light Classic, the ShopTire LPGA Classic, and the JAL Big Apple Classic. The following year she won only one tournament, but in 2000 she performed at top level, winning five championships. In 2003 Sorenstam became the first woman to play in a Professional Golf Association (PGA) event in fifty-eight years. That May she competed in the Bank of America Colonial. However, not all of her fellow players appreciated her presence. Two weeks before the tournament, Vijay Singh said, according to SI.com, "I hope she misses the cut." Although Sorenstam did fail to make the final cut, she found the experience invaluable, feeling that she had come away from the Colonial a better player. She called the event "the greatest thing that will ever happen to me, golfwise," as quoted by Steve Elling of the Knight/Ridder Tribune News Service. "The pressure I was under, I figured if I can handle that, I should be able to handle everything." That same year Sorenstam was inducted into the World Gold Hall of Fame, becoming the youngest person ever admitted to the Hall. For her, 2003 was "definitely the most memorable year I've had," according to Elling. Indeed, after winning three of the four major LPGA tournaments and participating at Colonial, 2003 could easily be considered her best season yet. Yet the Women's Open title still eluded her. After her two initial wins, she failed to claim another U.S. Open title. She had come close several times but, as she told Hank Goal of the Knight/Ridder Tribune News Service, "A lot of the time I get in my own way. I want it so badly that I screw up." But Sorenstam did not let this get her down. "The competition is tough; the courses are tough," she told Gola. "But I've learned a little bit the last few years." Her game-plan for future U.S. Opens was, as she told Gola, "to go back to basics, playing my own game, taking it one day at a time and one shot at a time." By 2004 Sorenstam had begun to talk about the possibility of retirement. Her desire is to keep playing as long as she still enjoys the game and pushing herself to perform at top level. But, as she told David Teel of the Knight/Ridder Tribune News Service, "The competition is getting tougher every year. So the question is how much longer can I do that? I think that will determine how long I play." Sorenstam married David Esch in January of 1997. In her free time, she enjoys computers, cooking, and music. "Annika Sorenstam." Great Women in Sports. Visible Ink Press, 1996. Elling, Steve. "Sorenstam Makes It to Hall." Knight/Ridder Tribune News Service (October 20, 2003). Gola, Hank. "Sorenstam Struggling Heading into U.S. Open." Knight/Ridder Tribune News Service (July 2, 2004). Sirak, Ron. "Let the Debate Begin: As Annika Sorenstam Adds Seventh Major Trophy to Her Collection, Some Peers Ask: Is She the Best Female Golfer Ever?" Golf World (June 18, 2004). Teel, David. "When Sorenstam Exits LPGA, It Will Be on Her Terms." Knight/Ridder Tribune News Service (May 6, 2004). "Daddy Knows Best: Sorenstam Owes Success to Father's Early Lessons." SI.com (October 18, 2003). http://sportsillustrated.cnn.com/2003/golf/10/18/bc.glf.sorenstam.ssucce.ap/index.html (accessed on August 26, 2004).